Self-Checkout System Market size was estimated at over USD 2 billion in 2016 and is predicted to grow at over 8% CAGR from 2017 to 2024. The rising proliferation of retail supermarket chains and the need to enhance the customer experience are driving the growth of the global self-checkout system market. Such solutions lead to a faster throughput by reducing wait times and offering a hassle-free checkout experience to customers. The integration of NFC technology with self-checkout terminal helps in enabling customers to perform touch-free transactions. In addition, by embedding RFID, the whole process of article identification can be expedited. The machine offers an automated experience for order processing and helps in eliminating the need to stand in long queues, particularly in the retail industry. The solution accelerates the processing of transactions and providing a hassle-free experience for shoppers. The need to expand the consumer base and loyalty has led growing installations of such terminals that not only save consumers’ time but also prevent them from standing in long queues. Such trend is expected to further propel the retail self-checkout system market demand over the forecast period. The system is sold as an integrated solution with hardware, software, and service all provided by the manufacturers in most cases. With the infrastructure development trends and the potential for the adoption of the technology across developing regions, the self-checkout kiosks market is expected to witness a sharp growth over the coming years. Moreover, OEMs are aiming at making the solution more affordable along with technological improvements to increase its penetration across several industry verticals. Self-checkout product, software, and service solutions are designed with capabilities to meet the emerging needs of customers and compete with new technology innovators. Hardware solutions include terminals and kiosks with sub-components such as barcode scanners, display devices, weighing scale, etc. Software solutions feed data to the back-end office for business analytics, customer behavior, real-time tracking, and inventory management. Growth in revenue generated from software license is driven by the increase in hardware sales and growing trend of store transformation. Services performed by system providers include the installation of self-checkout units along with all the wiring and connections, integration of the machine with the customer-specific software application, and seamless connection across all devices. Individual service providers and service contractors offer solutions for the management of the self-checkout system including IT network design, data cabling, onsite installation, and hardware build & configuration. Some service providers in the space include Total IT Solutions, NEISA Nordic AB, and T&D SRL, among others. The self-checkout system market is segmented into cash-based and cashless units. The systems that accept payment only in electronic form are classified under cashless solutions. Cash-based terminals require additional hardware for currency processing, along with constant monitoring of available cash denominations and recycling of currency whenever required. In addition, they are more expensive than cashless models. The demand for cashless models is expected to witness a large growth over the forecast period owing to the customer preference toward the usage of cards for payment. In addition, the added benefits of cashless models including a less complicated system and lower price are driving the demand for cashless self-checkout kiosks market. A growing trend in the industry is toward the contactless payment using NFC technology and smartphone-enabled payment options. Such factors are expected to propel the industry growth for cashless models over the forecast period. Self-checkout system market is bifurcated into standalone, wall-mounted/countertop, and mobile models. Standalone machines require a dedicated space on the deployment user’s floor, thereby making the solution viable for installations with a large floor space such as supermarkets or hypermarkets. In addition, with the rising demand for avoiding long queues at supermarkets, standalone models offer ease at the checkout points to shoppers thereby saving time and enhancing customer experience. Such trends are expected to positively drive the growth of the self-checkout kiosks market. Standalone terminals have large footprints with most models exhibiting an industrial look and feel. The growing requirement for department stores reflects an aesthetically-pleasing and customer-friendly design, driving demand for self-checkout system with smaller footprint such as wall-mounted/countertop with the ability to leverage credit/debit only transactions thereby creating a better fit and ease-of-use in the end-user environment. The machines help the store owners to reduce waiting times during peak hours, particularly during high customer influx, driving the market. Countertop/wall-mounted units offer ease-of-installation and user operation. In addition, they also help in expanding the space within stores. The placement of such terminals next to impulse buys helps in generating an additional revenue for the store operators. Mobile solutions include apps for scanning of products through smartphone payment via mobile wallets and apps compliant with mobile payment solutions. The rising trend of store transformation has led to an increased demand for self-checkout system market in the retail sector. The terminals enable customers to process orders on their own and pay conveniently, relieving staff from operating cash counters and freeing up some staff on the floor with customer sales and queries. The demand to ensure and sustain loyal and satisfied customer base is driving shipments growth across the retail sector. In the hospitality sector, the demand for self-checkout kiosks market is expected to witness a sharp growth owing to a large number of units deployed across fast food chains. For instance, in May 2016, the U.S. fast-food restaurant chain, Wendy’s, announced its plan to install a self-service kiosk at 1,000 franchise locations by the end of the year. The demand for the solution in the hospitality sector is primarily driven by the need to cut the labor cost and improve the customer satisfaction. The solution helps in maintaining customer loyalty through the reduction in wait times, which serves as a beneficial strategy for hospitality clients. North America and Europe dominate the global self-checkout system market by region owing to the high degree of technology adoption. The U.S. self-checkout kiosks market dominated the global industry in 2016 owing to a large number of retail installations. For instance, in 2012, NCR announced the installation of 10,000 self-service checkout lanes to over 1,200 Walmart locations in the U.S. during 2013. The rapid adoption of automated solutions and the presence of a large number of regional players in the region have also factored in boosting their adoption in the region. The Asia Pacific self-checkout system market is expected to witness a sharp growth over the forecast period as favorable infrastructure development trends are driving demand for a technologically-advanced shopping experience. Burgeoning construction market, infrastructural development, increasing FDI in retail, and the booming tourism in the UAE and South Africa are expected to serve as key opportunities for market growth in the MEA region. 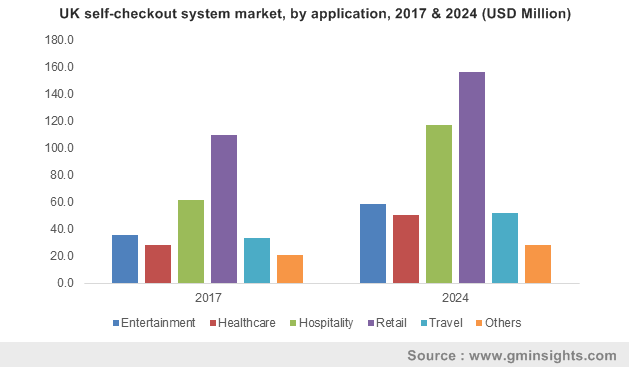 Self-checkout system market players have adopted various strategies such as investments in R&D, technological innovations, price differentiation and mergers & acquisitions to gain a competitive advantage. Players are offering low-cost solutions, especially in developing regions, to lure customers and oust competitors from garnering the market share. The declining price of sub-components has also helped market players to offer these machines at competitive prices. The growing competitiveness among system providers has resulted in the development of innovative and advanced solutions. Among the overall competitive strategies, the integration of the technology with diverse applications, followed by partnerships & collaborations constitute major strategies adopted by key vendors. A large network of technology partners also helps vendors to expand the scope of their products across various regions. Key players in the self-checkout system market include NCR, Diebold Nixdorf, Fujitsu, and Toshiba Global Commerce Solutions, among others. The self-checkout system market is characterized by technological development and creating a global presence through partner programs and long-term collaborations. Key players’ strategies include horizontal integration and acquisition of technologically-sound companies to enhance the capabilities of their self-checkout solutions. The growing demand from customers to curb wait times and long queues coupled with the need for better customer management is expected to drive the adoption of self-checkout kiosks market in the region. The continued developments in modernizing store formats particularly in developing regions have also propelled the industry growth over the past few years. Other factors driving the growth include integration of the technology with smartphones, the rise in the purchasing power, high customer willingness to use such terminals, and favorable government initiatives. Such trends are expected to drive self-checkout systems market demand over the forecast period.